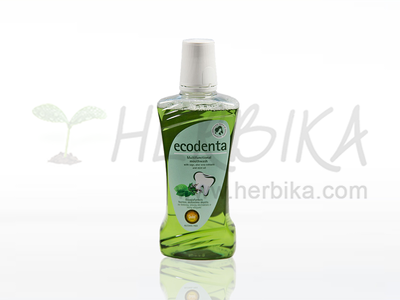 Multifunctional mouthwash with sage and aloe vera extracts, and mint oil for the care of hard-to-reach areas. This alcohol-free mouthwash perfectly complements everyday teeth brushing and ensures better protection against tartar. For children under age 6 use small amount and be careful they do not swallow it. Make sure they do not swallow. If you are using any products containing fluoride, consult odontologist or your doctor. Usage: Rinse your mouth for 2 minutes after each brushing or meal; do not swallow. Rinsing the mouth with water afterwards is not necessary. Ingredients: Aqua*, Sorbitol*, Glycerin*, Polysorbate 20, Aloe Barbadensis (Aloe Vera) Extract*, Salvia Officinalis (Sage) Extract*, Sodium Benzoate*, Potassium Sorbate*, Menta (Mint) Oil*, Aroma (Limonene), PEG-40 Hydrogenated Castor Oil, Sodium Fluoride, Chlorhexidine Digluconate, Citric Acid, Sodium Saccharin, CI 19140, CI 16255, CI 42090. *96% ingredients of natural origin.